As a kid my favorite sports car was a DeLorean. One of my schoolmates’ parents drove one and I used to marvel as I saw its gullwing doors open from the low silver stainless steel sleekness. My schoolmate, Jill, told me her parents thought it was a headache because they couldn’t open the car doors in a normal-sized garage. But who cares? That was part of the fantasy. Now, I have a new fave sports car. And it’s American, too. The Rapier SL-C (for Superlight Coupe). 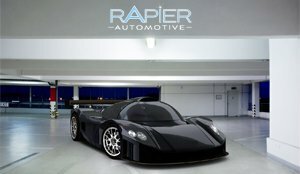 If you’ve never heard of Rapier Automotive, that’s because it’s a relatively new company. (And, in case you were wondering, it has nothing to do with the old Sunbeam Rapier cars.) Based in Boston, it planned its flagship offering for the last five years. It’s got the gull-wing doors of the DeLorean . . . and gull-wing everything else. It looks a little like a Formula One race car (and does use some Indy-style mechanisms), and I don’t care for the red “look-at-me” version. But in black, it’s sharp–like something Batman would drive. In fact, the black version looks a lot like the Batmobile. So what’s the damage for this cool new car? At $179,000 and up, it’s out of my price range, but still relatively cheap compared to European sports cars (such as a Lamborghini or Ferrari). But if you want one, you have to be patient. Rapiers take nine months to build, and they are built to the buyer’s specifications, including floor level, headroom clearance, steering, pedal position, seat size, etc. You can also choose between three V8 engines. It weighs about 1,000 pounds less than a corvette. The majority of the Rapier Superlight is hand-built around the dimensions of the buyer; floor level, headroom clearance, steeling and pedal position, even the seat size… the entire car is built to the owners’ unique specifications. Many of the components start as a bare block of aluminum and spend the first 50-60 hours coming to life on a CNC machine. The suspension is by Indy-style pushrod actuated coil-over shock units, of which the rear ones are arranged longitudinally. Rapier Automotive has incorporated superior components from around the globe to finish off the Superlight; a complete Aeromotive Fuel System, QA1 Aluminum Double Adjustable Shocks, CCW Wheels and Alpine, Pioneer, & Beltronics entertainment electronics. 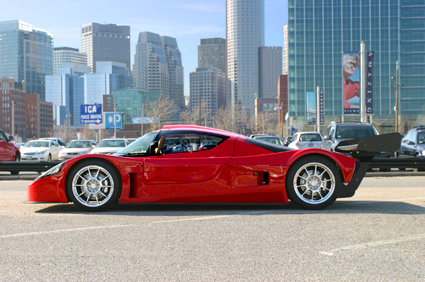 A test drive can be arranged out of Boston with one of two shows cars, chassis number one and chassis number two. If after the test drive a buyer wishes to place a 50 percent deposit towards the purchase of a SL-C, which start at the comparatively reasonable price of $179,000, Rapier will pay for the entire trip to the New England-based city. Rapier Automotive offers a very competitive payment plan that will allow its customers to have the car completely paid off by the time the car is ready for delivery, approximately nine months later. Besides the fourteen diverse exterior colors and hand-stitched leather and optional carbon fiber inserts for the interior, the Rapier also offers a plethora of sound system interfaces and wheel options that come in chrome, gloss, satin black or painted to match to the rest of the car. The DigiDash display puts all the pertinent information in the driver’s face and keeps track of an assortment of vital statistics and analytics; allowing the owner to do everything from optimizing the engine tuning to simply keeping track of his or her lap times. No idea what the gas mileage is on this thing, but you don’t buy a car like this for its fuel efficiency. I like it. Whaddya think? If not this one, what’s your fantasy sports car, and why? Yes, I know times are tough. But it’s always fun to dream. That looks low enough to the ground that you better not run over a taco. All kidding aside … let me repeat. Yowsers. A question for Debbie, if she has time and inclination to answer … are you into racing? If yes, anything series in particular? One word I CAN say: WOW! That car looks like it’s ready to race! And I wouldn’t be surprised that there WILL be a strong market for these cars. Americans LOVE their cars, and they LOVE sleek, powerful cars. Once the market for the Rapier takes root, look for our “illustrious” Leader and his UAW goons to try to put the kibosh on production of this car altogether. A 2006 Chevrolet SSR (yellow only and as many factory options as possible) and a 2008 Pontiac Solstice (yellow only and as many factory options as possible). Neither are considered cheap cars but that’s what my budget allows for. You’re right, this is basically a very expensive toy. If you have that kind of money, you don’t worry about gas milage. It’s probably a blast to drive and if I was filthy rich, I might just buy one. Unfortunately, I’m not. So for the time being, I’ll stick with my Corvette. It’s always been my “dream car” anyway. Finally a subject I can relate to. Very nice machine would like to know more detail. My favorite is the afore-mentioned Delorean which you can still purchase brand new, The company just started selling new versions using new-old stock out of San Antonio, TX for about 25K. As soon as I save up some money I’m buying one. Nice I suppose. But I’m still pretty partial to my jeep wrangler which I can take just about any darn where in any weather, climb some hills, find a nice quiet lake waaaayyyyy up in the mountains where the air is crisp and Obambi won’t dare to come. Give me my Avanti—-Started as a Studebaker product (1963-64) and then went private through many determined owners—ALL NON UNION—HOORAY!!!! Last Avanti rolled out in 2006—but one never says never. May Avanti rise from the ashes. Avanti still means FORWARD!! …and NON-Union, too. If you share my appetite for speeds >150 mph and preference for American cars, may I suggest one of the replica Cobra makers. Factory Five Racing not only makes the original-configuration open Cobras, but also replica Cobra Daytona coupes and a loose replica of the Ford GT-40 called the GTM Supercar. Superformance Inc. does a true GT-40 replica, and a replica of the 1963 Corvette Grand Sport. All these can be had factory-built for a fraction of the Rapier’s price tag and any of them will get you from Flint to the Big Mac bridge in amazing time. Sigh, another really cool car for the “Under 6′” crowd….oh well, think I’ll stay with my Harley…. Let’s hope this one lasts longer than the Vector. I just wish they were based somewhere else than the People’s Commonwealth of (M)Assachutes. Sorry, I’m not impressed. Its gratuitous curves remind me more of the car kits of the late 1960s. (Folks would buy a VW Beetle, remove the body and replace it with a fiberglass alternative, usually hinting at a super-car within.) I’m sure this is a fine car, but its design lacks integrity, offering instead only pointless excess. I’ll take an Audi R8 or Jaguar XK over this one any day, and for much less. And if I want American, I’ll get a Vette. For gullwing lovers, there’s also the SLS Gullwing from Mercedes AMG division for about $200k. Oh, for the days when even a performance car like a Porsche 911 could be had for less than ten grand! The Rapier is a beautiful, handcrafted 200+ MPH piece of Jewelery. Engine right from GM Performance (standard is LS376). A nice feature, any Chevy dealer can service it . can a ford motor be put in it. can a ford motor be put in thiscar? @ m carroll if you want a ford motor,then you might as well buy the Ford Gt-140… I don t remember the number designation but I do believe is 140, it sells for about the same price,only thing is is kinda crappy for the price.